UPDATE 4/23/2019: Team Boom! Cameras, comprised of Alcinda Brubaker, Chris Simmons and Emily Hostetler, closed out the semester simulation with top scores as well, including a #3 global ranking in both earnings per share and best stock price for the week of April 15-21. GLO-BUS, said Kioko, helps students learn the four functions of management: planning, organizing, leading and control. Marketed by McGraw-Hill Education, it has been used by nearly 32,000 students in 29 different countries in the last year. 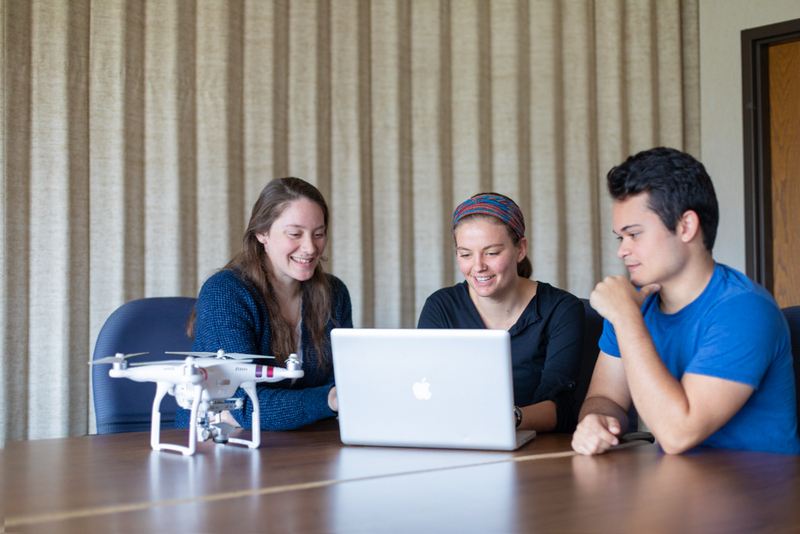 A “hands-on exercise” that reflects “real-world competitive conditions,” it gives students an opportunity to “run companies that are in a neck-and-neck race for global market leadership” selling wearable video cameras and camera-equipped drones in four geographic regions, its website says. In the simulation, Kioko said, the students learn how to staff a business and adequately compensate people; how to make team decisions including about ethical practices, such as how much to spend on sustainability efforts; and how to interpret and improve their financial performance each round. “It challenges you to make decisions in real time as you would at an organization,” said Musselman, a psychology major with minors in Bible and religion, leadership, and nonprofit management who plans to serve the local community or internationally.